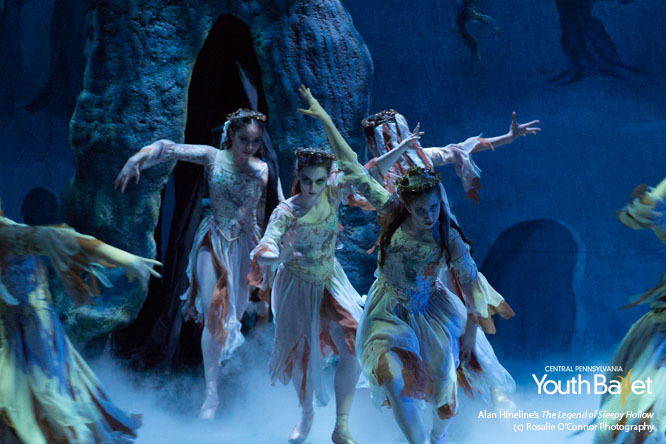 Central Pennsylvania Youth Ballet dancers Sarah Clarke, Sonja DeSario and Mercedes Corral performing “The Hollows” in Alan Hineline’s The Legend of Sleepy Hollow (2014). With the opening narrative of every “Twilight Zone” episode, Rod Serling left no doubt about what was ahead. We weren’t really meeting aliens or seeing gremlins on plane wings or matching wits with malevolent ventriloquist’s dummies. We were battling our own imaginations, where fear lurking in murky corners has the power to make us question the line between reality and make-believe. With its blend of music, costumes and dancers trained in defying gravity, ballet can give an otherworldly cast to the corporeal. But as even Serling knew, committing that intersection of fear and imagination to story form can be tricky. One false move, and the illusion is shattered. Perhaps that is why, of all the art forms, ballet succeeds where others fail. With its blend of music, costumes and dancers trained in defying gravity, ballet can give an otherworldly cast to the corporeal. Dancers take form as spirits and fairy princesses, swans and life-sized nutcrackers, and audiences, wholeheartedly, capitulate into believing. Since its debut in 2002, Central Pennsylvania Youth Ballet’s The Legend of Sleepy Hollow has grown in stature. It is a staple in CPYB’s repertoire, and a Halloween favorite of dance companies nationwide. As the air takes on a chill, audiences ask for spooky thrills, leavened with a dollop of humor. “Sleepy Hollow” delivers. Hence, meet The Hollows. They represent the departed spirits of the village, guarding over its heritage and, when necessary, directing the living to do their bidding. Giving life to that illusion of otherworldliness on stage wasn’t always easy, especially during the first production. 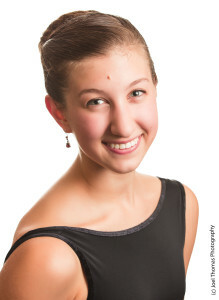 CPYB alumna Rachel Maher danced the Principal Hollow in the “Sleepy Hollow” premiere. 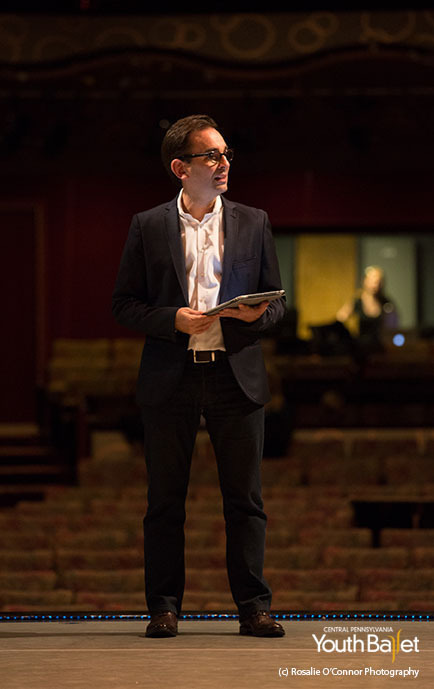 Unlike established productions, the new show demanded trial and error in rehearsal as it came to life. Maher remembers a steep bridge that had to be rebuilt when the dancers’ pointe shoes kept slipping. She also had to throw a cloth over fellow performers to put them in dream states, but the cloth refused to cooperate in dreamy fashion and often floated away. Maher and her self-described “freaky hands” with backward-bending fingers suited Hineline’s creation of what are now called “Hollow hands,” a carriage meant to convey a haunting posture. “Each dancer in front of me during the choreographic process has a collaborative impact on the final product,” Hineline said. Today, CPYB student Sarah Clarke takes such physical cues to bring out the spookiness in her role as a Hollow. Ballet dancers often play ethereal characters, seeming to float off the ground, but the Hollows occupy a sort of netherworld, residents of the spirit world whose feet remain planted in the earth where they were buried. Clarke finds that dance, in all its ethereal nature, can transport her, just as it does audiences. “We’re supposed to be a sort of guardian angel, but more on the creepy side,” said Clarke. “We have to move our arms around a lot so we’re almost floating over the surface of the earth, but at the same time we’re very low to the ground. Clarke, of Dillsburg, is in her second “Sleepy Hollow” production. With every CPYB performance, she is sharpening her acting skills, making each moment seem as though “it hasn’t happened before and you haven’t rehearsed it five billion times.” She has learned to attend each of those five billion rehearsals with a new backstory for her character in mind, perhaps pretending that her Hollow is the mother of one of the hooligan Sleepy Hollow Boys and hoping he’ll mend his ways. 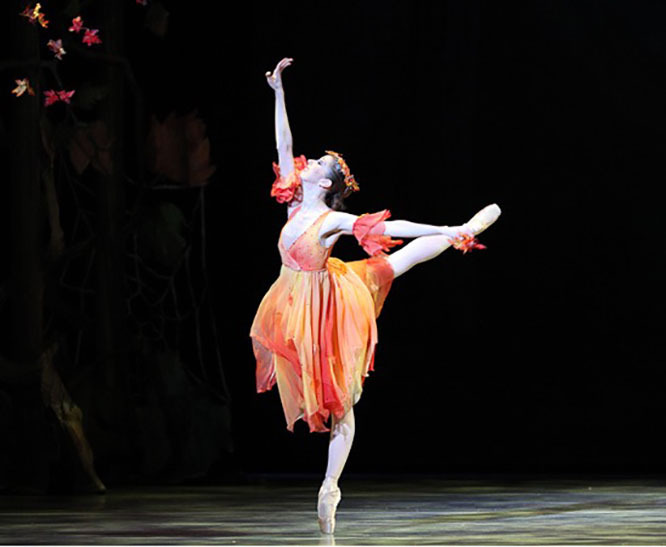 Rachel Maher performing the role of “Autumn Fairy” in Ben Stevenson’s Cinderella.